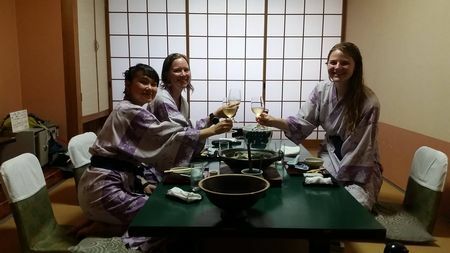 The trip I recently took to Ryokan Igaya was extraordinary. 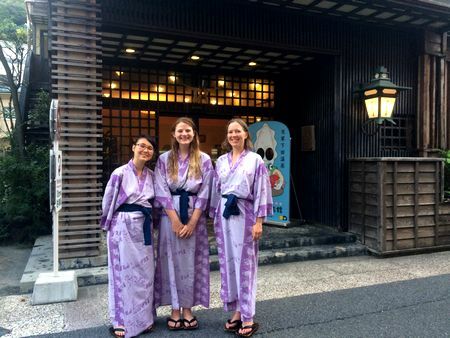 I had never been to a Ryokan before but knew I had to go before leaving Japan. A place like this seems to exist outside of time where you truly get to experience traditional Japanese culture in a beautiful tranquil location. delicious sea food and countless other places waiting to be discovered. We cycled from Hondo to Ryokan Igaya and as soon as we arrived it seemed like a great idea to go to the onsen. The onsen was serene with its water coming from natural hot springs. and the fun purple yukatas with ninja images on them. Dinner was the most creative and delicious meal I have ever had. It was five courses mostly consisting of amazingly fresh seafood. The presentation followed the ninja theme utilizing dry ice and fire. I encourage everyone to see the beauty at this special place in Japan.